All of the programs have 100% positive music and humor, multimedia, dance, crowd interaction and education to deliver messages of important life-skills. I've been speaking and mentoring students since 2002. If you've ever been concerned about bringing an assembly to your school/organization for fear of your students not being engaged, entertained or educated DON'T WORRY THIS WON'T BE ONE OF THEM! The goal of the Bullying Prevention Assembly entitled the #BeAHeroTour is to educate today’s youth through the vehicles of 100% positive music and humor, multimedia, dance, crowd interaction to build a bridge to education. "Rock Your Mic" basically says the same thing caring adults say, we just put "Rock Your Mic" spice on it because it tastes good going down! 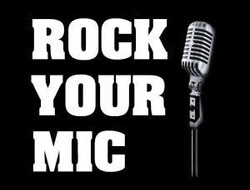 Earn cool points today with fellow administration and students by bringing "Rock Your Mic" to your area. The #BeAHeroTour is a 45 minute - 1 hour action packed bullying prevention assembly that is setup to empower the bystanders aka modern-day superheros to show good citizenship skills of standing up for and apologizing to those who are bullied. Also, teaching the skills to report bullying behavior to the proper authority. "How to make the M.O.S.T. of your life" is a great for a motivational or leadership program! People in attendance will understand ROCK YOUR MIC's tag line... "The world is your platform... just ROCK IT!" and this learn the importance of making the M.O.S.T. out of their lives. During this program you have the option to have us use our SMS/text/email opt-in feature that will allow students to give their feedback and receive the encouraging messages they have thought of to encourage themselves and fellow classmates. Avoid drinking and other drugs. Help hold my friend accountable. Team up with someone stronger than me. Not to text while driving. Write down my "dream" on my hand to remind me why boundaries are important. Incite’s on endurance and not giving up. At the end students will be able to make a strategic plan on how to implement these steps in 2 weeks.